Arthur ‘Swat” McCabe and Clyde Waters were teammates on the old Endee baseball teams of the 1920’s, one of the best semi-pro outfits in the country. Waters was born in Ohio and had a long and distinguished career in a variety of sports although he made his name locally as a strong-armed catcher for the N.D. team from 1919 to 1926. When his playing days ended, which included playing in the New York Yankees organization, he became on of the most respected sports officials in the area, particularly in football, where he worked some of the top college games in the East. 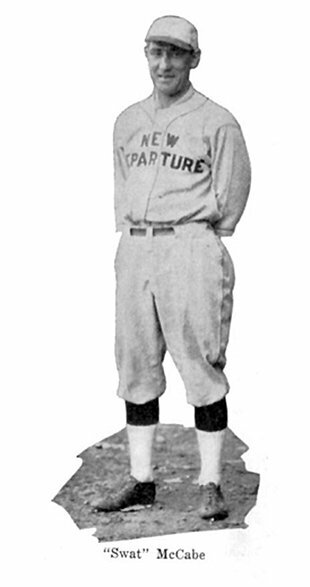 McCabe, who came to Bristol by way of Pennsylvania, had a long baseball career which included stints with the Cincinnati Reds in 1909 and 1910. He came to Bristol in 1919 and his powerful bat made him one of New Departure baseball’s favorite players. Following his playing days, he coached the Celtics and West Ends in Bristol while becoming one of the better known bowlers in town. The McCabe-Waters Little league, the city’s first Little League, was named in honor of the Endee’s stars when it was founded in 1949.